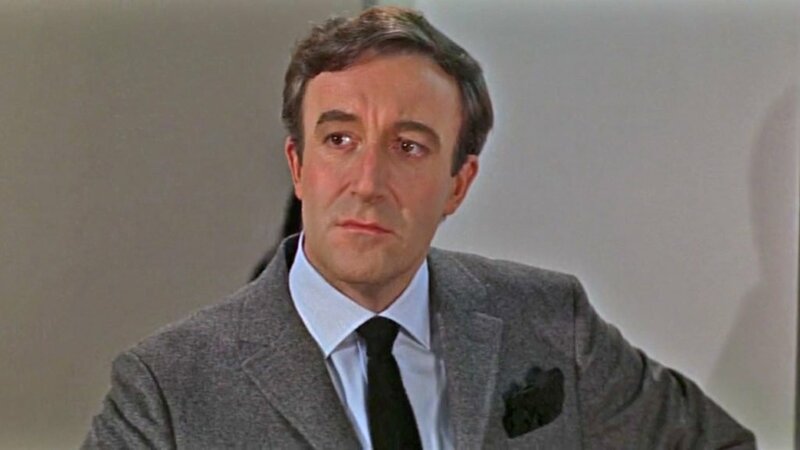 After Evelyn Tremble, Peter Sellers’ character in the 1967 James Bond spoof Casino Royale, is given the name “James Bond”, he is also given a fresh wardrobe so he looks the part of the legend. 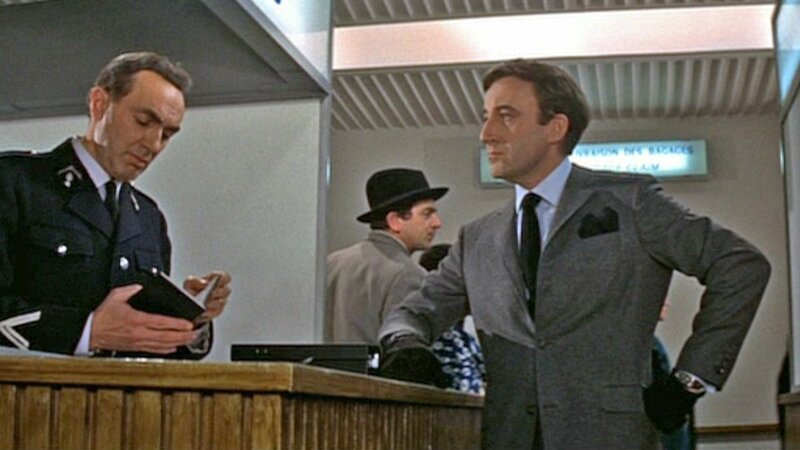 One of James Bond’s favourite suits in the official EON James Bond series is the dark grey flannel suit, and it gives Evelyn Tremble the sophisticated look he needs to pretend to be James Bond. Major Hayward, a popular celebrity tailor in the mid 1960s, made this dark grey woollen flannel suit for Sellers. Major Hayward was founded by tailors Dimi Major and Douglas Hayward, who later individually tailored official James Bonds. Dimi Major made clothes for George Lazenby as well as for other men in On Her Majesty’s Secret Service. Douglas Hayward tailored Roger Moore’s wardrobe for his last three James Bond films in the 1980s. Major Hayward was based in Royal Parade in Fulham, London, where Dimi Major would continue to operate after he and Hayward split no long after working on Casino Royale. Hayward then worked from shirtmaker Frank Foster’s basement storeroom on Pall Mall before establishing himself on Mount Street in Mayfair. Hayward likely had more to do with this suit than Major, as it is similar to suits he made for others at the time. The suit has a button three jacket with three buttons on each cuff, straight flapped pockets on the hips, a narrow welt breast pocket, double vents and sporty swelled edges. The jacket is cut with softer shoulders and a close fit through the body. The fishmouth notch lapel—also known as a Parisian lapel or cran Necker—was one of Hayward’s signature styles at the time, which can be seen on Michael Caine’s blue suits in Alfie and in Get Carter. 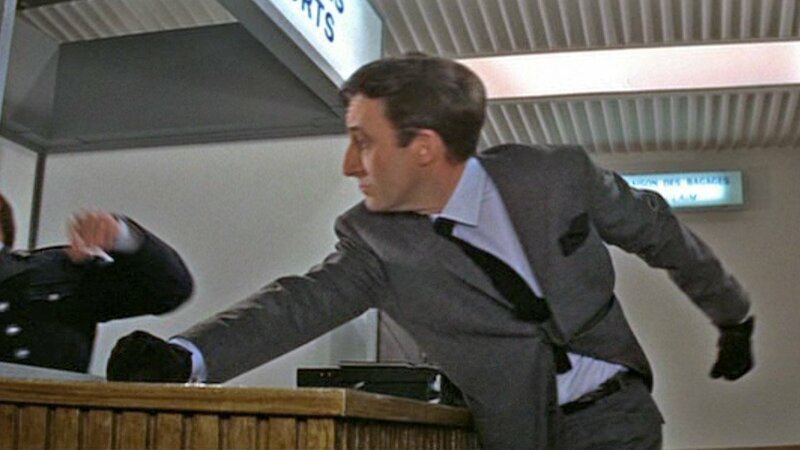 Hayward also used it on some of Roger Moore’s clothes in A View to a Kill. The lapels on this suit are slightly narrow, which was still the trend at the time. The jacket for this suit has the same cut as Sellers’ checked suit I previously wrote about. The trousers for this suit are hardly seen, but they are likely made in the same style as the checked suit’s trousers, which have a darted front, frogmouth pockets, a classic rise to the waist and moderately narrow straight legs. Sellers wears the trousers with a black leather belt. Sellers’ light blue end-on-end shirt from Frank Foster has a spread collar, a front placket and rounded double cuffs (with a large curve) with the link holes placed close to the fold to better show off the cufflinks. Straight from Ian Fleming’s James Bond, but not mentioned in the Casino Royale novel, the tie is black knitted silk with a straight hem, tied in a fat four-in-hand knot. He matches the puffed pocket square to the tie in colour but not texture with one in black woven silk. He wears black leather gloves with this suit. whats your opinion on the black pocket square? the gorge seems a too high even for the period wouldn’t you say? The black pocket square is a bit unimaginative, but it’s not bad. The gorge is indeed a bit high. It would typically be around the height of the collar points (of this type of spread collar) rather than above. What do you think of the suit’s fit, Matt? The final photo seems unflattering to say the least. We don’t see the suit in a natural, relaxed position, so we can’t judge the fit from how we see it. Because his dinner suit fits very well and has the same cut, we can assume this one fits just as well. 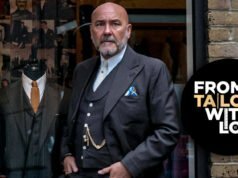 I suppose we’re all enamored with the Savile Row’s notion that a suit should fit like being painted on the person, with the collar glued to the nape, and sleeve length perfect and whatnot, while reality proved itself otherwise countless times. Spy thrillers of the old days are, to me, the biggest debunker of most tailoring myths. No one looks good when they have to get into actions. I don’t even look that good in my Anthony Sinclair suits, despite the very excellent fit that it already provided. I would have to disagree. I can think of numerous instances where the suit and the hero were a great combination during the action. The thomas crown affair, when brosnan steals the painting comes to mind. As for bond, goldeneye; when he escapes from the base. Mr Alvirez’s point is that often a suit does not look good when moving in certain positions. 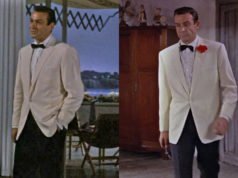 An actor can be directed to move in ways that may a suit look its best, and shots can be “tailored” so that the suit is worn in a way to make it look its best. Pierce Brosnan poses in ways that make his suits look best. His suits would have the same problem if he did was Sellers was doing in these shots. Remember one of Fred Astaire’s old photo of him wearing Anderson and Sheppard? Remember how A&S famously claim that their collar is almost like Velcro to the neck? It did not happen in that photo, and it certainly did not happen to a variety of people I know wearing A&S or other bespoke suits. The only most ideal condition for a suit to look like how we imagine it to be is either under Photoshop, or else under very limited movement, or as with the case of my Anthony Sinclair suit, limited to modest movements. Anything else other than that, we have to expect such thing as collar gap, sleeve shortening, pulling elsewhere, and whatnot. In my eyes, a suit is most beautiful and alive when the person wearing it is moving, but to have the perfect flattering to the traditional account of a tailored suit, one can only stay still, or do as little as a Dolittle. I have hopped up and down wearing my suit, carry heavy stuffs, run about after buses, and bending back and forth while wearing my suits. Even the best like my Anthony Sinclair has got to have a couple quirks here and there. It’s just that it’s a lot more comfortable, feels more freely, and settles right back to the body once I settle down. I guess there are expectations when one pays so much money, but set the expectation realistic is perhaps a good measure. I think the lower button stance of Brosnan’s suits as Bond would still result in a more flattering shot than it does here. The button stance of Sellers’s suit here seem way too high, almost similar to today’s standards. Not a big fan of the black pocket square, it ruins a bit the outfit for me. Too much matchy matchy with the other accessories. A white one, or none at all, would have been more flattering. You’re right on point with the button stance. Basically a button is a suspension that acts as a closure, pulling together two front pieces of the jacket. The placement of a suspension can heavily affect the outcome of movement as a result. In this case, it pulls the front quarter, and hence the sides, and the rest of the suit just follow suits in a domino fashion. I don’t dislike the idea of the black pocket square, since it’s not the same material as the tie, but I don’t like it with a medium-to-dark gray suit like Tremble is wearing. There isn’t enough contrast, so instead of creating visual interest it makes the suit look drab. 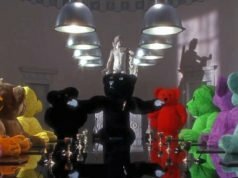 Is interesting that at times ( mid-late 60s) for movies the production asked suits to trendy tailors and not to more classic and solid firms (as Anderson & Sheppard,or Gieves or Poole or Stovel & Mason, for exemple). I don’t think the reason were money. Likely in that time cinema’s people loved flashy trendy suits.